While Adam and Connie are away, I thought I'd give you an update on the journey of rescued sea turtles from the Gulf. 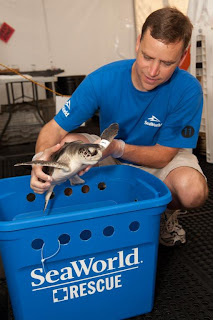 SeaWorld Orlando just took more sea turtles from Gulf World, in Panama City, FL. 6 Kemp's ridley and 13 green sea turtles were de-oiled at Gulf World and then transferred to SeaWorld, where they will have more space to care for these animals. Here is a video that shows their path to recovery at SeaWorld. 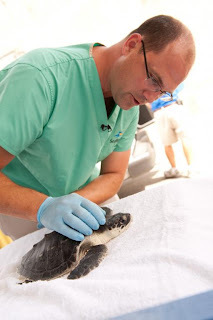 The pictures below show the sea turtle recovery at SeaWorld, which is acting as a secondary facility for oiled turtles before release. As of last week, 10 or so nests (1 of which was a Kemp's) have been relocated from the Florida Panhandle to the Kennedy Space Center (See our previous posts about nest relocation here). 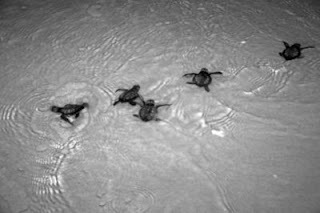 The first sea turtle hatchlings have been released on the Atlantic coast of Florida, and here is a video. The photo below shows the first Kemp's ridleys being released. This New York Times video is a great news piece that I recommend you view. A word of warning about the video: Some of the necropsy, or animal autopsy, scenes may be disturbing to some viewers. Thanks for the updates Kerry!